Where are the railways monitoring reports? 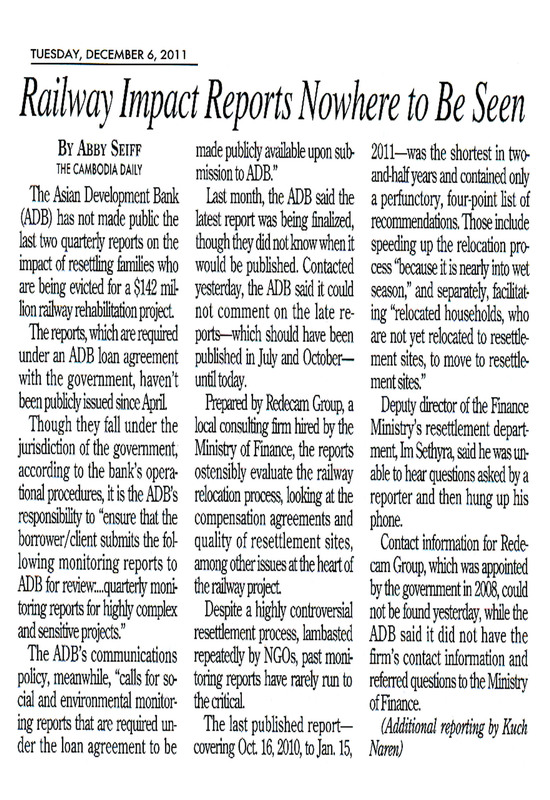 No new social monitoring reports on the railways rehabilitation project have been published since November 2012, raising concerns about the lack of external monitoring of the project as well as public access to information regarding the project. Redecam, the supposedly independent project monitor hired by the government, is meant to submit quarterly reports featuring details of the social impacts of the the ADB and AusAID-financed project. These are subsequently uploaded to the ADB website for public access. Yet the latest publicly available report, #19, covers the time period Aug-Nov 2012, and no reports have been public since. While the quality of Redecam’s reports has generally been poor, the lack of reports entirely underlines the ongoing lack of transparency and accountability that has plagued the railways project from the get-go.